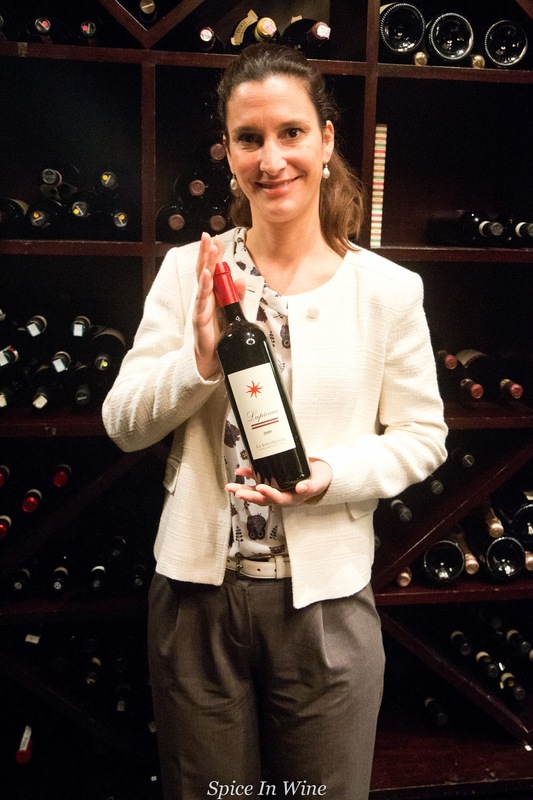 Ms Carolina Zucchini Metelli, Sales Manager of Castello del Terriccio (Tuscany), was in town recently to showcase her company's wines. 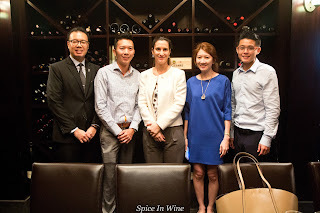 The team from Grand Vin Pte Ltd organized a tasting session for the local media folks to share with us information on the winery and its Tuscan sips. 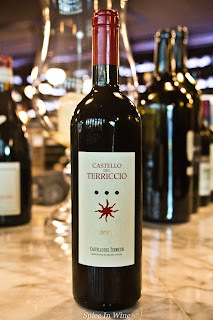 Going by size, Castello del Terrico is one of the largest estates in Tuscany (at 1,700 hectares) explained Ms Carolina. It's located long the coastal shores of Maremma (between Pisa and Bolgheri), facing the Tyrrhenian Sea. Much of this estate is given to forest lands, olive & cereal cultivation and breeding of horses. Vine cultivation at present takes up 60 hectares of the land. The current owner, Gian Annibale Rossi di Medelana Serafini Ferri (also affectionately known as ‘Pucci’), inherited this estate in mid 1970s and embarked on a wine making initiative. He sourced for good vine cuttings from France to plant in his estate. Varietals like Chardonnay, Sauvignon Blanc, Cabernet Sauvignon, Cabernet Franc, Merlot, Syrah and Petit Verdot found a home in his estate from late 1980s. Under the guidance of consultant oenologist Carlo Ferria, the winery adopted new vinification methods like the use of stainless steel for fermentation, French Allier oak barriques for aging wine and a shorter aging period in oak for wines to highlight fruit quality. At present, this winery’s main export markets are USA, China and Russia. The first 2 wines easily showed freshness, purity of fruits, ready-to-drink approachability and a cheerful personality (ideal wines to start an evening with). The noticeable acidity played a good part in keeping the fruit element lively in both wines. 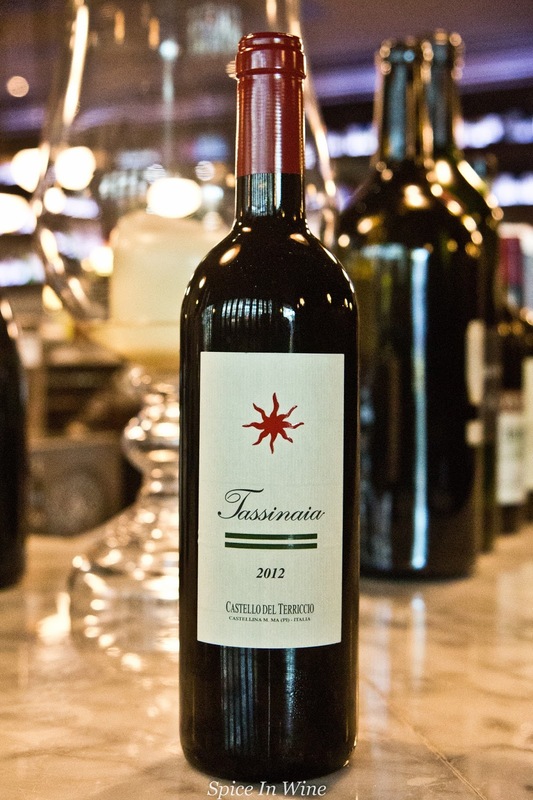 The 3rd wine (Tassinaia 2012), while retaining primary fruit notes as the Capaninno 2014, showed a higher flavour intensity and complexity in its body while displaying a 'ready to drink now' quality as well. The last 2 red wines revealed a persistent core of dark fruits in their body, noticeable depth, complexity, and ample tannins to justify aging to allow for further development. Blend of Sauvignon Blanc and Viognier. Carolina explained that this is a small production of 5,000 bottles/year. 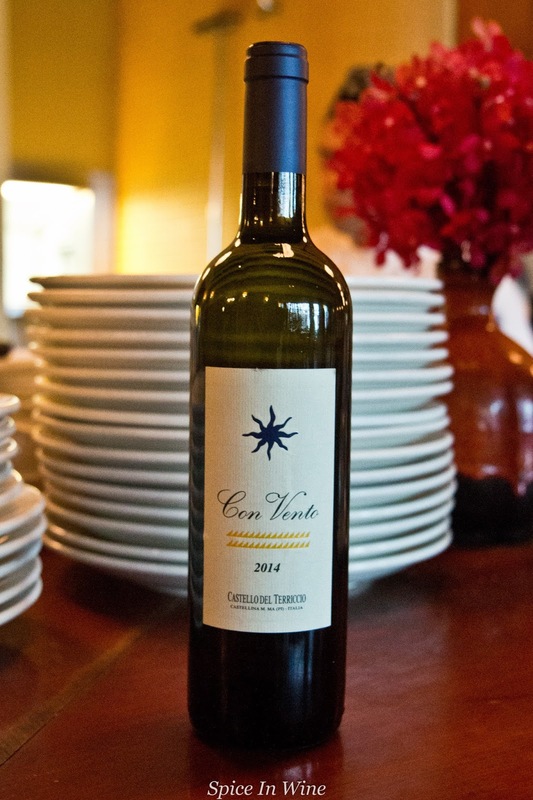 It’s an aromatic wine highlighting herb and floral notes. A lively, fresh fruit intense sip with a rich, supple, viscous mouthfeel. It’s not often that one comes across a SB and Viognier blend ín Singapore, I must add. The SB gives acidity and liveliness to the wine, while the Viognier contributes to the body weight and mouthfeel I suspect. Sur lie aging plays its part to contribute to the viscous nature of the body, I beg to suspect again. It makes for a good aperitif and an ideal companion for seafood dishes. Another fresh and lively wine; this time a red blend (Merlot and Cabernet Sauvignon) highlighting the purity of fresh fruits in its body. Cherry and eucalyptus aromas reveal on the nose, with fresh red fruit flavours and acidity making for a youthful palate. A medium bodied wine enjoyable at this moment. A red made of Merlot, Cabernet Sauvignon and a little Sangiovese; and aged 6 months in used French barriques. A medium bodied wine which still shows primary fruit notes in palate (without being overwhelmed by tannins). 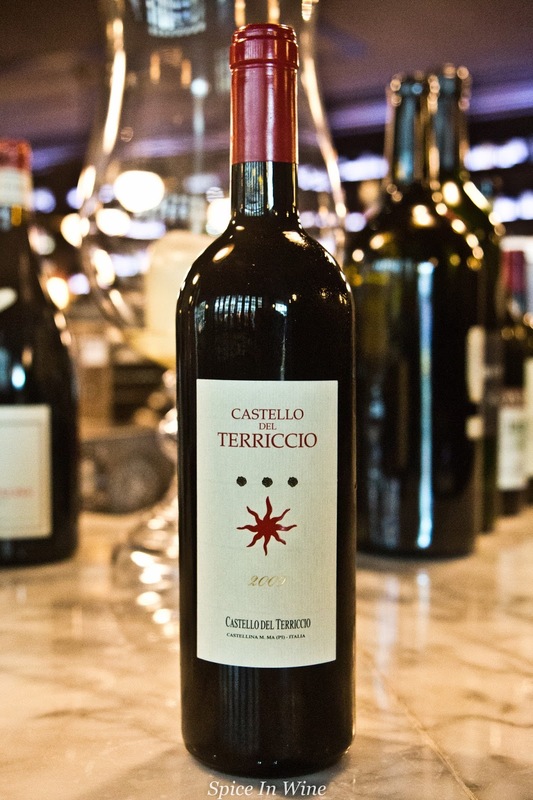 Black berry, blue berry, cedar, spice, cassis and hint of chocolate notes add to the complex nature of this wine. 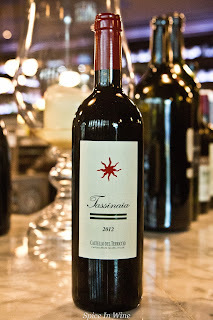 Good balance, depth, smooth tannins and a lingering finish add to its charm. You can keep this wine (it has the quality for mid-term aging), but I see no reason for such a venture as it makes a delightful sip at this moment. A red blend; Shiraz (50%), Petit Verdot (25%) and a mix of other red grapes (25%). It’s aged for 20 months in new French oak barriques; and spends another 5 years in bottle before release. 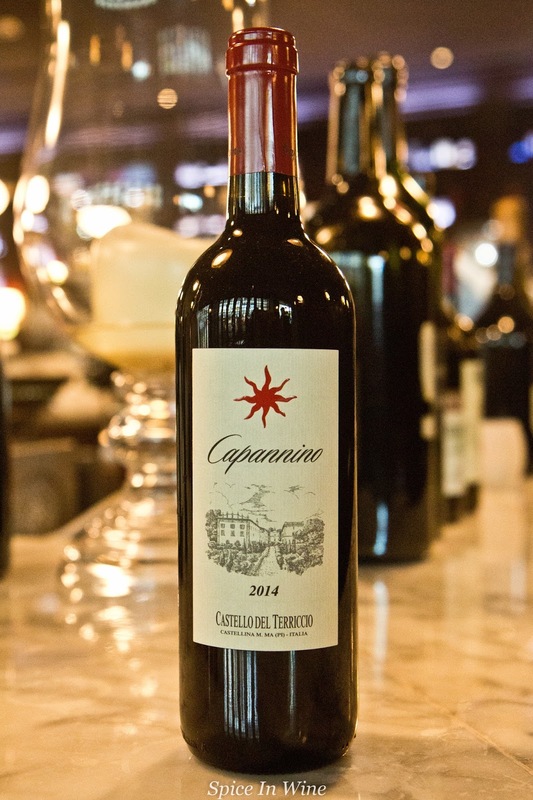 A complex wine with dark fruits, black berry, spice, leather and tobacco aromas; a good core of dark fruits in its body with ‘grippy’ tannins adding to its character. It’s got a good structure and a strong constitution; making it an ideal candidate for further aging and development. Carolina highlighted that Lupicaia is this winery’s flagship; it’s first vintage being 1993. It’s a blend of Cabernet Sauvignon, Merlot and a little Pertit Verdot. The varietals are fermented and aged separately in new French barriques for 20-22 months before blending takes place. It’s aged another 5 years in bottle before release. 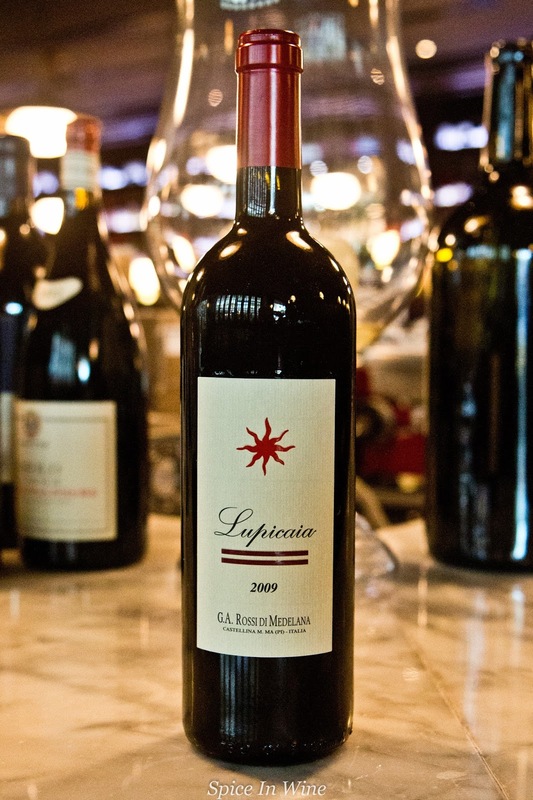 Black fruits, spice and tobacco notes reveal in nose and palate; a balanced, complex sip with good depth. There’s a lovely smooth, silky texture to its body which highlights elegance rather than a show of power. This is another wine which shows the potential to age and develop further.